One of my favorite parts of being an Education Officer on the JR are the video conferences with schools, museums, aquariums and other groups. Inquisitive people and the interesting questions they raise about the science on the JR and shipbard life make our day lots of fun! For example, some interesting lateral questions we have been asked are; if there was a prison onboard or do we carry guns to protect ourselves? We’re prepared for all sorts of questions but these surprise and amuse us! Yesterday we had a video conference with students at the University of Otago in Dunedin with their erudite professor, Dr. Chris Moy. Hailing from New York where he gained his Ph.D. from Stanford University, Chris recently immigrated to NZ. He was attracted by the quality of life and accessibility to the landscapes around Dunedin. In NZ he enjoys rock climbing, trekking and spending weekends outdoors. Westerly winds in the Southern Ocean also drew him to NZ as well as his research collaborations. He is currently reconstructing past variations in wind from cores taken in NZ lakes and wetlands. Chris has one Ph.D. student and several masters’ students working with him on the Holocene changes in hydrologic balance, temperature and vegetation due to these westerly winds. As well as the projects they share, he appreciates the caliber and hard working attitudes of the NZ students. 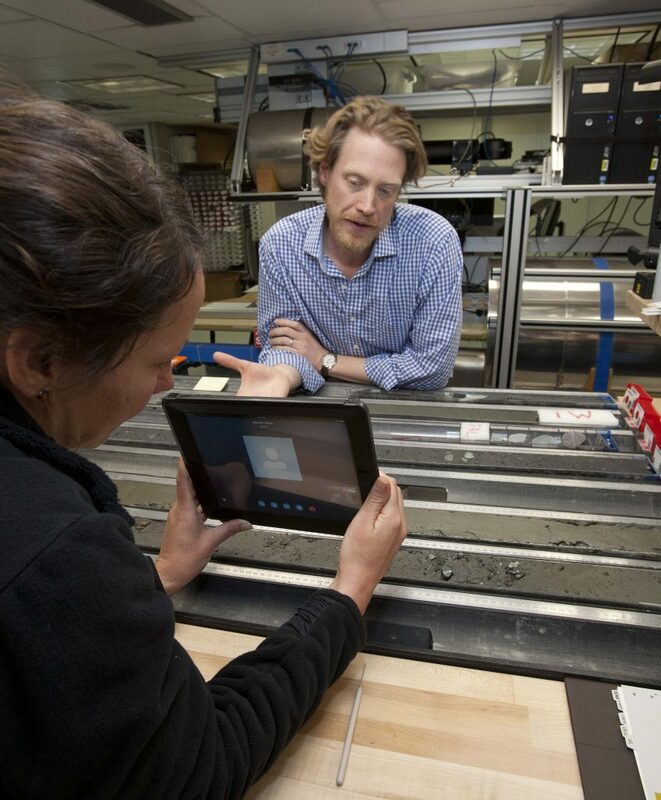 This is his first expedition with IODP as a sedimentologist. Back in Dunedin at the University of Otago he is a Professor of Geology. In September 2012 he began working on a Marsden Fund 2011 research grant, under a Fast Start programme. His three years of research will cover work in air-sea CO2 flux in the Southern Ocean. Two undergrad professors at Union College and one of his masters’ professors at Syracuse University really got him hooked on geology. Traveling to the Peruvian Andes on geology field trips as an undergrad solidified the interest. To date the most interesting core samples on Expedition 341 for Chris have been from site KB-2 where there are a diverse range of sediments, coarse diamicts, oozy biogenic sediments and dramatic changes in a high-resolution site. Up until this expedition his work has been terrestrially based in lakes and fjords in NZ and Chile. His future work entails developing sedimentary records of global change from multiple marine and terrestrial sites in New Zealand as well as continuing his work on marine sediments with IOPD. Geology students at Otago are lucky to have such an enthusiastic and talented professor. We have been very fortunate to have him with us on the JR!